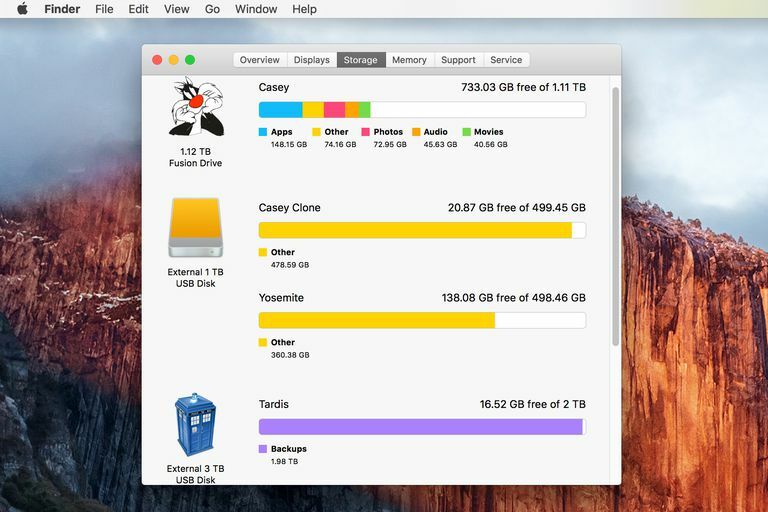 How Much Free Drive Space Do You Need on Your Mac? If you find that your computer is starting to operate slowly, is taking a long time to start up, giving you the rainbow cursor for very long periods, or taking a long time to launch an application, you may need to free up some space. Do I Need a Bigger Drive? There are many different types of problems that can manifest the symptoms described above. Insufficient RAM or even hardware failure could be the culprit. But one of the most common causes of the problems when a computer is slow is not having enough free space on a hard drive. Filling your hard drive until it's almost full can present many issues. First, your Mac needs some free space to use for creating swap space to manage memory use. Even when you have adequate RAM, OS X will reserve some space at startup for memory swap space. In addition, individual applications usually use some disk space for temporary storage. Many pieces of the operating system and many applications use drive space, usually without your being aware of it. When it gets your attention, it's usually because of erratic system performance. In general, you should keep as much space on your drive as free as possible. A good guide for the minimum on the amount would be to keep at least 15 percent of your startup drive free at all times, although more is better. If you're getting to the point where you worry about your drive's free space, it's probably time to either buy a larger drive or archive some of the data and get it off the drive through an external hard drive or on the cloud. Th 15 percent value is best so that some basic OS X or macOS maintenance scripts will have sufficient free drive space to run. This includes the operating systems built-in disk defragmentation system, memory swap space, and enough space to create cache and temp files when your Mac starts up. To free up disk space, start by selecting a target location for offloading data. You can copy files to another drive, burn them to CDs or DVDs, place them on a USB flash drive, store them in the cloud, or in some cases, simply delete the files. It's best to look to your Downloads folder first because it tends to collect a lot of files which are overlooked over time. After that, check the Documents folder for old and outdated files. Do you need to store your 8-year-old tax files on your Mac? Probably not. Next, look at your Pictures, Movies, and Music folders. Often times you'll find duplicates in those folders. Once you have gone through the home folder and all of its sub-folders, check the available free space. If you're not above the minimum, then it's time to consider additional storage options, either a larger hard drive or an additional drive, probably an external drive for storing data files. If you add more storage, don't forget to factor in enough backup storage to cover your new capacity. Having free hard drive space well above the 15 percent minimum is a good idea. The minimum only ensures that your Mac will start up, operate, and be able to run a basic application or two. It doesn't guarantee your Mac or the applications will run well, or that your graphics, audio mixing, or video production applications will have enough scratch space to function though. What About Solid State Drives (SSDs)? Yes, they may, but it depends on the specific architecture of the SSD you're using. Generally speaking, SSDs need a large amount of free space to allow the SSD's controller to perform garbage collection, as well as the process of resetting blocks of data so they may be used again. The reset or garbage collection process requires entire blocks of data to be rewritten to unused blocks on the SSD. So having limited free space can impact the process and cause excessive write amplification (wear on the NAND memory cells that can lead to early failure). The amount of free space needed is very dependent on how you use your SSD. It's recommended to save 15 percent for general use, which assumes that you're using TRIM or an equivalent system to assist in garbage collection.